Meldwyn realizes he’ll need to be proactive if he wants his turn on the rocket before he grows old. 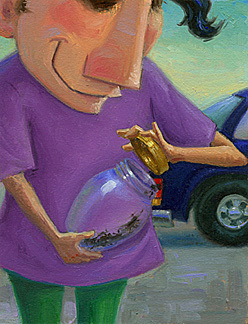 Fortunately, he happens to have a jar full of spiders in his backpack that he’d captured in his Karma-Clean vacuum. He’d planned on repatriating them in the park until he’d been distracted by a certain kleptomaniac squirrel. He senses that perhaps now might be an advantagous time to release them. The spiders that hadn’t been eaten by their jar-mates happily spill out of the jar onto the sidewalk in front of the store. Just a brief mention of this fact aloud has little Timmy screaming with delight and jumping from the rocket to check them out. Timmy’s sister Lila does the same when she sees a few big, hairy ones crawling in her general direction. Lila’s screech has a much scarier pitch than her brother’s though, and it almost makes Meldwyn feel bad as he replaces the now empty jar into his backpack. He smiles as he climbs into the rocket to undertake his intended mission.